Solvents play a major role in industrial production: They can dissolve, dilute, and, in a very fine distribution, absorb other substances without changing them chemically. Solvents (sometimes also called dissolvents) are mainly used in the paints and varnishes, print inks, and adhesives industry but also, for example, as an ingredient of pharmaceuticals, cosmetics, and detergents. Substances that cause unpleasant odors, explosive vapors, as well as health and environmental damages are controversial and increasingly targeted by the legislature. Ceresana analyzed the global market for solvents already for the fourth time. The largest consumers of solvents are manufacturers of paints and varnishes, followed at a considerable distance by producers of printing inks. Demand on the part of the pharmaceutical industry ranked third, followed by utilization in cosmetics and adhesives. Other important applications are chemical manufacturing processes, cooling circuits, dry-cleaning, and deicers. However, a trend away from solventborne products and towards more environmentally friendly alternatives based on water is prevailing in the segment paints and varnishes. This development has an inhibiting effect on demand for solvents. The industry in Asia-Pacific accounted for about 44 % of global demand in 2017. China dominated the market, followed at a considerable distance by Japan and India. The regions North America and Western Europe ranked second and third. Ceresana expects constantly high growth rates for Asia-Pacific. In the segments paints and varnishes, printing inks, and adhesives, this region is the major consumer. On the contrary, Western Europe and North America account for the largest demand in the segments cosmetics and pharmaceuticals. Alcohols are the solvent type with the by far highest demand: especially ethanol, n-butanol, isopropanol, and methanol. The region Asia-Pacific is the largest consumer in the segment alcohols as well, with a demand of about 2.7 million tonnes, followed by North America. Besides alcohols, mainly ketones were utilized as solvents in 2017; but also aromatics, esters, and ethers hold significant market shares each. With an expected increase of 3.2 % per year, the group of ethers will be the fastest growing market. Chapter 1 provides a description and analysis of the global solvent market – including forecasts up to 2025: For each of the seven world regions, Western Europe, Easter Europe, North America, South America, Asia-Pacific, the Middle East, and Africa, demand split by solvent types as well as revenues are examined. Chapter 2 provides detailed data on solvent demand and revenues in 16 countries. 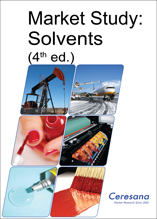 In addition, this chapter provides in-depth information on the demand for solvents in the sectors paints and varnishes, printing inks, adhesives, cosmetics, and pharmaceuticals as well as in other application areas. Chapter 3 offers a substantiated analysis of the application areas of solvents: data on demand development, split by the seven world regions. Additionally, demand per applications area is examined individually for the most important countries. Chapter 4 takes a look at the several solvent groups: alcohols, ketones, esters, ethers, aromatics, non-aromatics as well as other solvents. The following solvent types have been analyzed separately: ethanol, n-butanol, isopropanol and methanol, acetone and methyl ethyl ketone as well as toluene. Chapter 5 provides profiles of the largest solvent manufacturers, clearly arranged according to contact details, turnover, profit, product range, production sites, profile summary, and product types. Extensive profiles of 102 producers are given, including BP plc, Cargill Incorporated, China National Petroleum Corporation (CNPC), ExxonMobil Chemical Company, Oil and Natural Gas Corporation (ONGC), Petróleo Brasileiro S.A. (Petrobras), PJSC Lukoil, Royal Dutch Shell PLC, Sinopec Corp., and Total SA. Ceresana is a leading international market research institute and consultancy company for chemicals, plastics, industrial goods, and packaging. The company has been providing more than 10,000 customers from trade and industry in 60 countries with up-to-date analyses for over 15 years. The services of Ceresana for manufacturers, processors, and associations include implementation oriented consulting, customized single-client studies, and more than 100 market studies independent of the order.